Using your van or pick-up for towing duties should be straightforward, but there are a few steps to follow before you set off in order to stay safe and legal. We’ve scoured the finer details of the towing rulebook to give you essential tips before you hit the road with your vehicle and its extra cargo. The individual and combined weights of the vehicle and the trailer are among the most important things you need to know before you embark on towing. It’s vital that you stick to them; exceed them, and you’re breaking the law. The Gross Vehicle Weight (GVW) or Maximum Authorised Mass (MAM) tells you how much a vehicle or a trailer can legally weigh in order to be used on the road, while the Gross Train Weight (GTW) or Gross Combination Weight (GCW), is the total, permitted weight of the vehicle, the trailer and everything it’s carrying. You can find these figures on the van or trailer’s chassis plate, in the handbook and sometimes on the V5C registration certificate. Some trailers need brakes, some don’t, and it depends on the weight. Trailers with a Gross Vehicle Weight of 750kg or less are not legally required to have brakes, so the van handles the stopping part. Those with a GVW of 751kg or more have to be fitted with independent brakes, and are known as ‘braked trailers’. Braked trailers are usually fitted with overrun brakes, which operate automatically via a mechanical linkage connected to the tow bar. The trailer’s handbook should tell you whether or not it is braked or unbraked. You are limited to the size of trailer you can tow with a van, and again, weight is the dictator. 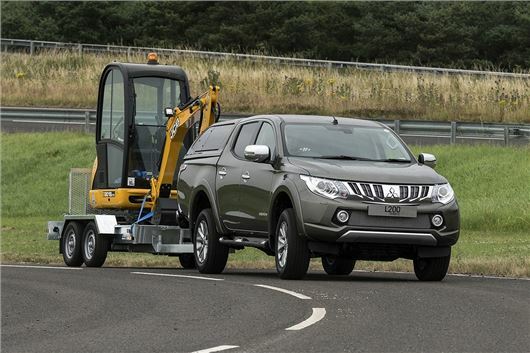 Conventional vans with a Gross Vehicle Weight of up to 3.5 tonnes are allowed to tow trailers up to seven metres long and 2.55 metres wide, so you’ll need a heavier vehicle and an appropriate licence if you want to tow anything larger than that. Trailers that are specifically designed to transport long, slender loads – such as boats and gliders – are the exception to the rule, as they can be longer than seven metres. Do you have the right type of licence? Generally, you don’t need a special type of licence to drive a van, and a normal car licence is fine for most conventional vehicles under 3.5 tonnes. However, towing heavier trailers and/or loads, that can put you over the limit of what you’re legally allowed to drive. Do you need a tachograph? Companies are legally obliged to fit a tachograph if the vehicle in question weighs more than 3.5 tonnes, so they are usually associated with the likes of lorries and buses. However, many modern vans and pick-ups can easily tow more than two or three tonnes, so you might need a tachograph if you plan to use this sort of vehicle for towing. As well as a tachograph, you might need an operator’s licence if the Gross Combination Weight of the van and the trailer exceeds 3.5 tonnes and the purpose of your trip is for business, while the driver may have to adhere to drivers’ hours regulations. Not everything fits neatly inside a trailer so it’s not uncommon to see loads poking out of the back. This is allowed within reason, but strictly speaking, the cargo should not overhang by more than 3.05 metres – and it needs to be secure. You can follow the rulebook to the letter, but if physical side of things isn’t up to scratch, then you’re asking for trouble. Before you set off, thoroughly inspect the connection between the van and the trailer: is the towball/pin in place? Is the towbar level (it shouldn’t be pointing up or down)? Is the breakaway cable correctly attached? Is the load secure and evenly distributed? Trailers and couplings can differ, so be sure to follow the manufacturer’s instructions and don’t be afraid to contact them if you need to. If you’re in any doubt whatsoever as to whether or not it’s safe, then don’t make the journey.